President Erdogan Is Reshaping Turkish Society, But At What Cost? 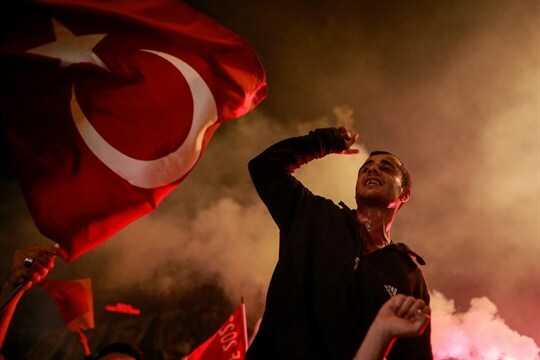 A supporter of Turkish President Recep Tayyip Erdogan during celebrations outside the ruling party headquarters, Istanbul, June 24, 2018 (AP photo by Emrah Gurel). As president of Turkey, Recep Tayyip Erdogan could be the wedge that destroys Turkey’s relationships with the U.S. and Europe. Find out more when you subscribe to World Politics Review (WPR). To learn the real prospects for Erdogan’s social revolution in Turkey, read Has Erdogan’s Attempt to Reshape Turkish Society Hit a Wall? for FREE with your subscription to World Politics Review. With Erdogan firmly established as the president of Turkey, the West may have to accept a new framework for political and economic relations with Ankara. To learn more, read The Dawn of Turkey’s Fifth Republic for FREE with your subscription to World Politics Review. Special introductory, limited-time offer: $12 for 12 weeks! Act now to take advantage of this special offer. YES, I want 12 weeks for just $12! Read about the current political climate and the long-term effects on Turkey, in How Erdogan Turned Turkey’s War on Terror Into a War on Dissent for FREE with your subscription to World Politics Review. The impact of Erdogan’s campaign to remake Turkey has also been felt abroad. A case in point was an incident in March 2018 in Kosovo, in which Kosovan security officers, aided by Turkish agents, detained and expelled to Turkey six Turkish nationals associated with the Gulenist movement. The expulsions attracted intense media scrutiny, both domestically and internationally. On the one hand, they fit into a broader story about how Erdogan has pursued suspected Gulenist members far beyond Turkey’s borders. In April, The Associated Press reported that Turkey’s intelligence agency had conducted “covert operations in 18 countries” that had led to the detention of “around 80 Turkish citizens.” But the incident also exposed something else: Turkey’s complicated relationship with Kosovo and the wider Balkan region. Analysts say the Balkans play an important role in Erdogan’s goal of maximizing Turkey’s global influence and reviving the glory days of the Ottoman Empire. Kosovo, which declared its independence just 10 years ago, has appeared to go along with this to an extent, in part because it views Turkey as an important strategic partner. Find out how Erdogan’s effort to remake Turkey has been felt in Europe, in ‘Turkey’s Puppet’: How Erdogan’s Anti-Gulenist Campaign Is Roiling Kosovo for FREE with your subscription to World Politics Review. How Erdogan’s push for a social revolution may not yield the expected results, in Has Erdogan’s Attempt to Reshape Turkish Society Hit a Wall? But this is just a fraction of what you’ll get in WPR’s searchable library of content, where you’ll find over 9,000 articles on topics such as international diplomacy, the global refugee crisis, global finance, economic trends, gender equality, water rights, and so much more! Editor's Note: This article was first published in October 2018 and is regularly updated.